Amethistle: Creativity for the Fun of It! : Look! It's a Quilt! If Abercrombie and Fitch were to sell quilts, this would be it. It's ratty and frayed. It has the dusky patina of ground-in dirt. It's irregular and uneven. Maybe it's not ripped up enough to meet those trendy A&F standards, but one has to draw the line somewhere. The jeans circle quilt is done. Well, at least for now. Until I decide to do more stuff to it. But for now, done. Oddly, having it finished seems pretty anticlimactic. It's probably because I don't really have a place or a use for it, since I really just did it for the challenge of it. It took me so long to make (just over a year of on-again, off-again work), and so much physical effort, that I feel I have to hang onto it until I find the right place for it. 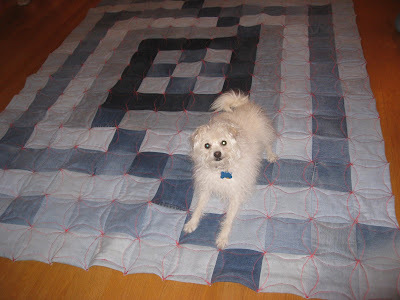 The "Quilt from Hell", as I'd taken to calling it, has 221 jeans circles (from roughly 30 pairs of recycled adult jeans) and 221 ~5-inch squares cut from a tie-dyed recycled sheet (as well as 442 squares of polyester batting). It weighs 8 pounds according to my scale, but it feels like more. I had made it up into three long sections, and then put the three sections together. 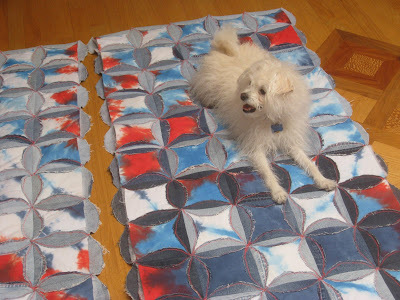 That was one of the reasons making the quilt was so difficult; I had to physically muscle those huge and heavy sections around and through my regular home sewing machine (a Husqvarna Viking Emerald 118). In hindsight, I would have made nine smaller sections and put those together at the end. The quilt is definitely unique. 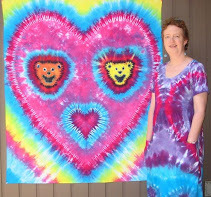 Besides the randomness of the recycled jeans circles in various shades, which are then laid out in a specific design, I also had the tie-dyed sheet. 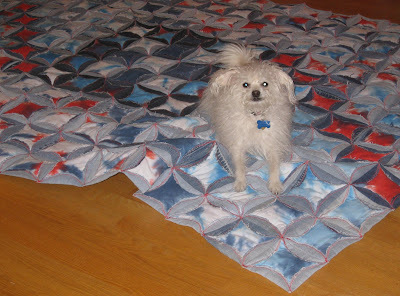 I had dyed it in a chevron pattern, then cut it all up and rearranged all the pieces. Someone I know wonders why people would take perfectly good fabric, cut it up, and sew it back together again. I just tell her to think of it as making paint from minerals and then smearing it on canvas--it's art. And in this case, it's taking something that isn't perfectly good (the worn out jeans) and putting them to good use. 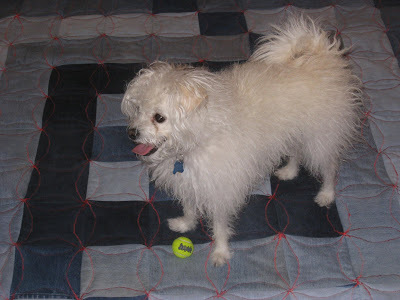 My quilt has something that no Abercrombie and Fitch quilt would have: dog hair incorporated into its deepest recesses. Lacey thinks that's just perfect. P.S. : I've managed to achieve my New Year's resolution! This may be a first!